Color span of male Oriolus, average for a given species. This is a csv file with comma as delimiter. It is an output from spectra processing in R software, package "pavo". LM Hue data for Oriolus males for the 13 plumage patches (see the accompanying publication for the codes). This is a csv file with comma as delimiter. SE across individuals of LM Hue in Oriolus males for the 13 plumage patches (see the accompanying publication for the codes). This is a csv file with comma as delimiter. MS Hue data for Oriolus males for the 13 plumage patches (see the accompanying publication for the codes). This is a csv file with comma as delimiter. SE across individuals of MS Hue in Oriolus males for the 13 plumage patches (see the accompanying publication for the codes). This is a csv file with comma as delimiter. Phylogenetic tree used in the study. For the source of the tree, see the accompanying publication. What is the tempo and mode of evolution – how fast and in what pattern do traits evolve – is a major question of evolutionary biology. Here we studied patterns of evolutionary change in visual and acoustic signals in Old World orioles. Since producing multiple signals may be costly, we also tested whether there was an evolutionary trade-off between the elaboration of those two types of signals. We studied 30 Oriolus taxa using comparative methods and a recent molecular phylogeny. Morphology and plumage hue evolved comparatively slowly, whereas song evolved rapidly. Among individual feather patches, the evolutionary rate of color was slowest in primaries, which are critical for flapping flight, and fastest in patches exposed to observers (mantle and breast). Thus, primaries seem to be under functional constraint while the evolution of visually exposed patches is perhaps shaped by sexual selection. Song evolution was comparatively fast, but also attracted to a single optimum. This may be due to selection for signal efficacy, because all orioles inhabit similar forested habitats. Only color diversity was best fit by a speciational model: the biggest changes in coloration were concentrated at speciation events, thus perhaps linked to the evolution of species recognition. Our analysis did not reveal any evolutionary trade-off between acoustic and visual signals, suggesting that the elaboration of visual and acoustic signals in the Old World orioles evolved independently. 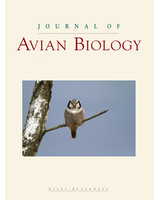 Our study shows that patterns of evolutionary change may be surprisingly complex even within a single clade of birds and thus further studies are needed to identify general patterns of signal macroevolution.